This Rondo is the third movement of Niccolò Paganini's Violin Concerto No. 2 in B minor, Op. 7, composed in 1826. It owes its nickname “La Campanella” (or “La Clochette” in French) to the “little bell” which Paganini prescribes to presage each recurrence of the rondo theme. 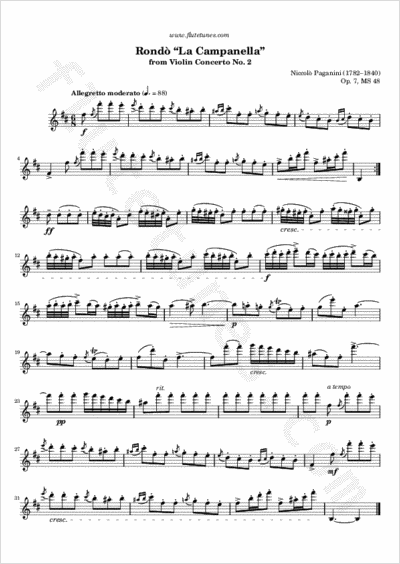 Like most of Paganini's works, the original rondo is longish, and includes very demanding, virtuoso passages. It also features very high harmonics. To keep you and us sane, we decided not to make a complete transcription of it, but only of its most well-known part.